Have you ever been out of shape and feeling a bit up and down? If you have you will know that it takes time to get back into shape and feeling “on the level”. Lawns get the same way but they are easier to fix and the effort required is minimal compared to the human program to stay in shape. 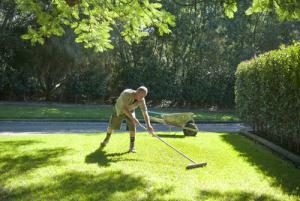 The magic ingredient to get the lawn back in shape is Topdressing and it’s a simple process. By now if you have been following the “Ten steps to Christmas” you will have mown the lawn down and eradicated the weeds. Now its time to purchase some sandy soil or loam as some call it and spread it evenly over the surface of your lawn. A five to ten millimeter cover over the lawn is the most you need to apply per application. Don’t apply too thick a layer as you will smother the lawn. The way to calculate how much soil you will need is to multiply the lawn length by width and then multiply that by .005 for a five mm coverage or by .01 for a ten mm coverage. This equates to one cubic metre of soil per 100 square metres of lawn. If you are not sure ring the Anco Turf advisory line on freecall 1800 010 110. After applying the sandy soil, rub it in with a broom and or level lawn. You can push a little more soil into the low areas and less onto the rises to even up the level of the lawn. Water the lawn immediately after you have rubbed in the topdressing and fertilized with a High nitrogen Lawn food such as Sir Walter Fertiliser or Anco Lawn Food which are both High Nitrogen lawn foods suitable for most lawn types. A second application of soil at a later stage may be required if you are trying to fix severe level problems. Just remember not to apply too thick a layer. If some of the grass leaf pokes through after dressing and watering then you have applied the right amount. Topdressing aids in thatch reduction and levels the lawn out which in turn reduces the unsightly scalping effect when you mow the lawn. In some cases it will aid drainage. So now your lawn is well on the way to becoming a superb specimen but its not quite Olympic standard yet. Next week we will talk about Vitamins for your lawn or legal performance enhancing products to help you win the lawn race. You will be in the Green Jersey by Christmas.